Swedish guitarist Magnus Gronlund holds a degree in guitar teaching from the University College of Music Education in Stockholm, where he studied for Peter Berlind Carlsson,Peder Riis and Stefan Lofvenius.He has also taken part in masterclasses for the likes of David Russell and Hubert Kappel. 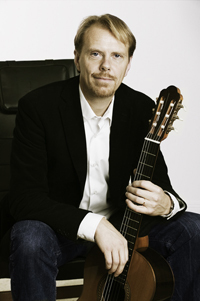 As a concert guitarist, Magnus Gronlund has frequently performed with symphony orchestras. He has received scholarships and been the finalist in a number of international competitions. In 1989 he won second prize in an Italian guitar festival arranged by Antiquae Musicae Studiosi. As a student Magnus Gronlund started to play together with clarinettist Dan Larsson in Duo Dialog. Today, the critically acclaimed duo has performed many well-received concerts at Swedish chamber music festivals and in churches. 8/8 Stockholm Huvudsta Slott, "Destination Astor Piazzolla"
20/5 10:30 Motala kyrka Lunchkonsert, "rain-refrain"